In this modern time, reading books means mainly relax. Nature and greenery is favourite place for relax in such rush times. We try to combine both these issues in our new library and create calm, undisturbed world isolated from the present. We bring greenery into the library. 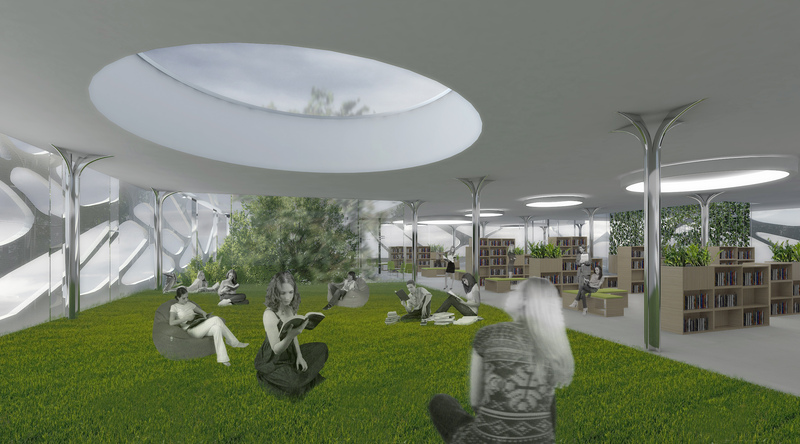 The modern library is a meeting place of books, media, people and ideas. 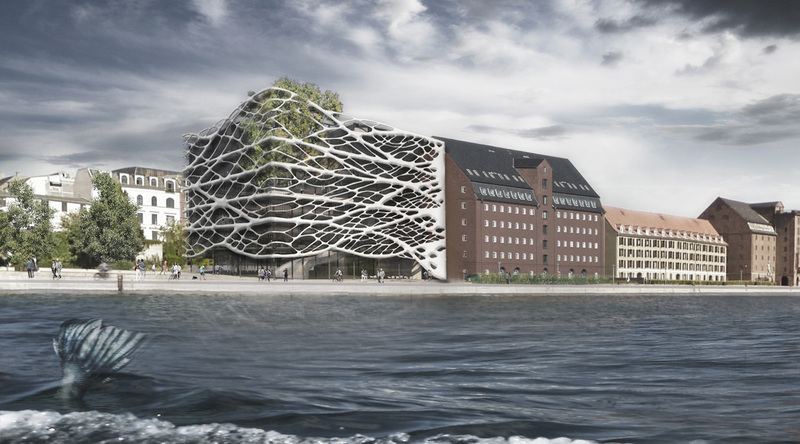 New Modern Library is located in the very centre of Copenhagen, the area that includes the old port of Nyhavn. One of the main features of the area is the presence of the waterfront, where the citizens and tourists like to walk. Another important aspect is the presence of the Opera House building designed by Henning Larsen. 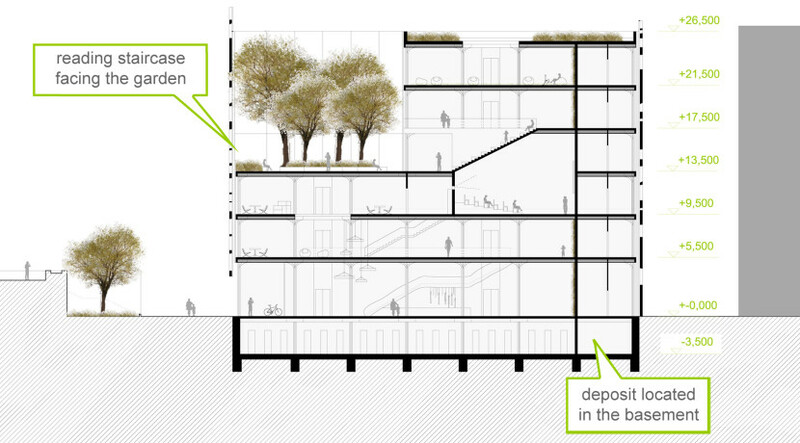 Volume of the library is determined by following waterfront line, closing element of the line of the buildings. It follows the axis of the park, which is perpendicular to the axis intersecting squares and connecting Frederik’s Church and The Opera House. Height of the library does not exceed the height of the neighboring building. 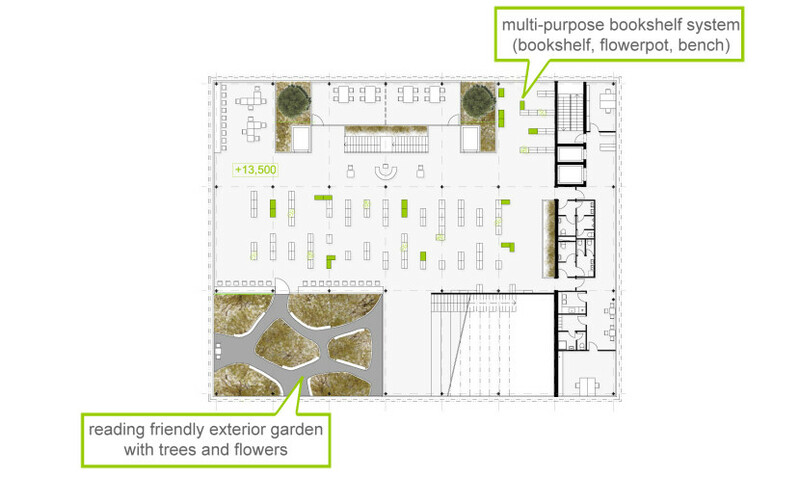 There are three levels of greenery in the space of library: house plants in boxes, vertical gardens and huge outdoor gardens. Visitors might read with view into the treetops or in outside gardens in case of good weather. Copenhagen historic buildings exist in symbiosis with modern architecture. The facade of library has a modern wave character. It’s shape has been inspired by the structure of a leaf, which symbolizes our concept – reading in nature. 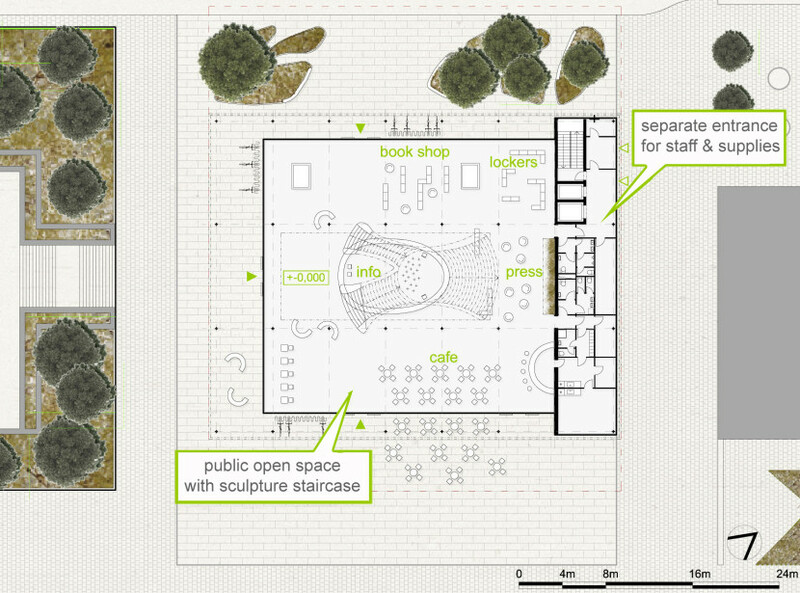 Overall spatial concept opens the building’s free space to the waterfront and park. Closed study rooms are facing the Toldbodgade street. The library offers a range of zones from silent to social. Study rooms and lecture rooms can be re-arranged using dividing walls in order to ensure privacy if necessary. Long tables with a set of notebooks and closed study for teamwork is provided on each floor. Apart from the classic sitting on the lounge chairs there is a relax area in for walking with no shoes. 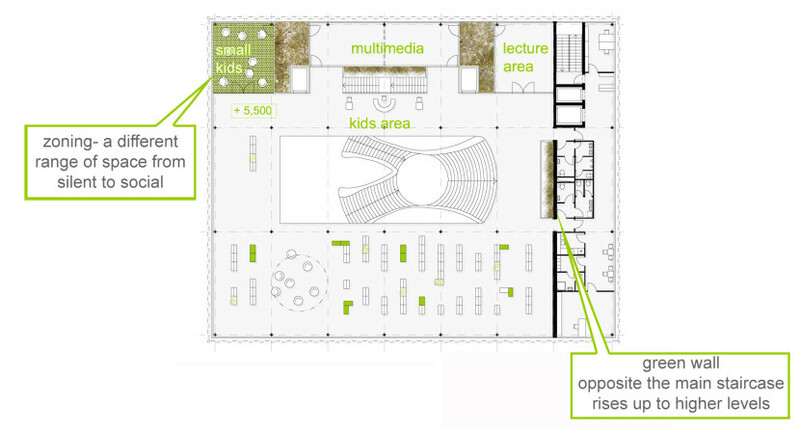 Thick green carpet and beanbags ensure high level of comfort. A direct double staircase is one of the two possibilities of moving from one floor to another. The other one is a pair of glass lifts sliding through green gardens as they move. At the base of the staircase there are two service counters for book rental business with information booth between them. The rest of the space is equipped with multi-purpose bookshelf system, which enables for several different arrangements of space. 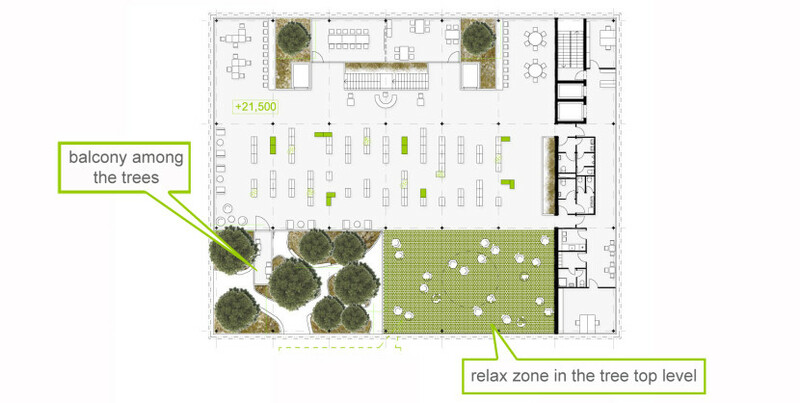 In the northern part of each floor there is a wall with a continuous vertical garden, beyond which public restrooms, access card secured offices and employee facilities are hidden. The visitor is actually navigated by the green plants, differenciated in three stages. Houseplants in pots point to a place where books can be found and borrowed. Vertical gardens and climbing foliage, symbolizes communication and social background. And lastly outdoor gardens for relaxing and reading. The library can be accessed from three sides. 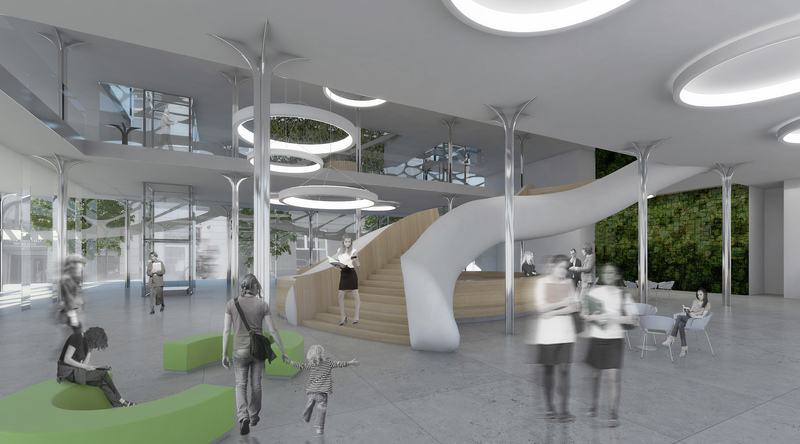 All public entrances lead to an elevated space with organic staircase and the registration counter. A sculpture staircase provide a welcoming ambience with the gravitas of the library. Entrance level is open for public. It is a place with bookshops, cafeteria and daily press. Using sliding windows this area can open up and expand the waterfront cafe. Staff entrance and supply entrance are separate and they are located on the north side of the road between the library and the adjacent building. Books may be temporarily stored in a handy stock or directly send via an elevator to the deposit, which is located in the basement. Employees have their own separate staircase and an elevator that can takee them into any floor of the library. At Toldbodgade street side there is a window for returning books at times when the library is already closed. The main staircase gets us to the children and youth area, which has several closed rooms for classes and children groups. The youth library is open to the waterfront. Third floor is a multimedia area, shelves are arranged to form smaller units with separate chairs for listening to music or playing games. There is a stage hall with a large format projection screen. 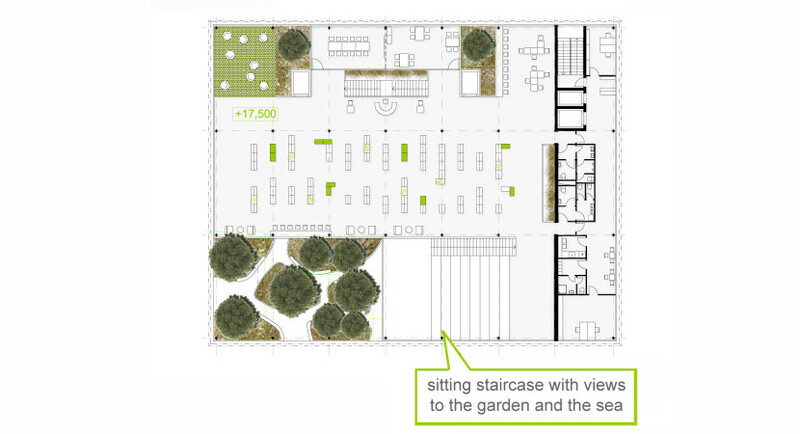 Fourth and fifth floors are connected with seating staircase and a spacious garden. 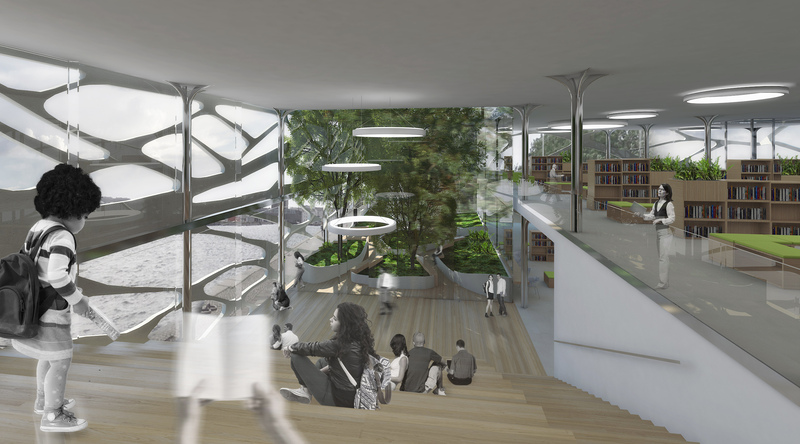 Main reading area and seating staircase are oriented to the main garden terrace. There are vistas to the sea simultaneously on the right hand side. 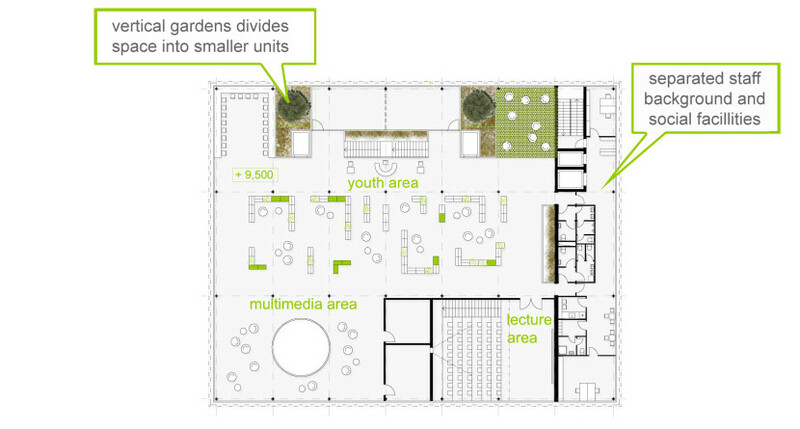 Gardens permeate through the volume of the library. Brings natural light and relaxing atmosphere to the interior. The sixth floor is leveled with the tree tops, among which we can enter using a long balcony. There is also the most relaxing space with natural daylight. The building is based on a monolithic white tub. The core system is a steel frame with cassette monolithic ceiling covered by acoustic dampening tiles. Frameless glass facade is anchored to the ceiling tiles, along with a steel frame for the offset facade. The facade itself is made of individual prefabricated parts of concrete TiO2 covered concrete. Each single part is reinforced with a steel plate and gradually added to the supporting structure. Each part is about 4 metres long and and profile thickness varies between 200 and 400 mm. TiO2 facade technology uses daylight to break down harmful substances in the air. Dangerous pollutants are turn into plain NO3. Garden terrace – rainwater harvesting system for irrigation. Solar Pv Panels are installed on the roof. This will be used to power the ventilation systems and lighting. Condensate water produced from air-conditioning will be collected and recycled to irrigate the greenery around the complex.